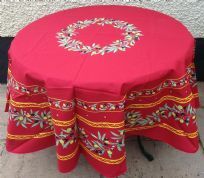 Here's a selection of our beautiful French tablecloths and table runners which are ideal for Christmas entertaining - we think they look lovely all the year round! The woven Jacquard Alpine tablecloth in hardwearing cotton and polyester mix even looks good on the reverse. The Olives collection in festive red and green is a perennial favourite and now features a round wipe clean version. Jacquard weave drapes beautifully and even looks good on reverse!